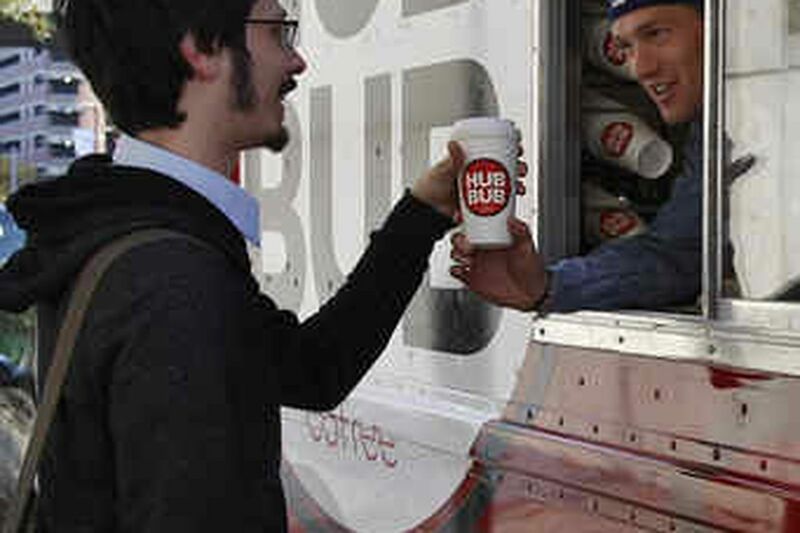 The brew sold by Drew Crockett is a fine addition to the street food heaven on wheels along 38th St.
Drew Crockett (in truck at left) sells a cup of Hub Bub coffee to Christopher Passanante. The food trucks that stretch along 38th Street near the western edge of Penn's campus provide an antidote to - no, make that a repudiation of - the sad-sack food-court fare that lurks in greasy shame just blocks to the east. Between Chestnut and Spruce Streets you will encounter, in no particular order, trucks offering soba noodles and bright, fresh-made chicken tacos, a deal at $2 apiece - un-Taco Bell tacos. There are speed bumps of baba ganoush (and feta) and Yue Kee's celebrated - long-lined - Chinese window besting a fair number of Chinatown's own lunch spots, and cheerily advertising proprietarily spelled ma paul tofu. And so on. A Queen of Steaks. The House of Pita. Bui's repertoire of egg sandwiches, judged to be the finest on wheels by one particularly enthusiastic regular. Missing from this aluminum smorgasbord, at least in the view of Drew (for "Andrew") Crockett, Penn '05, was an upscale coffee truck on the order of the ones he'd happily patronized working as a trader in New York's financial district. So last week there it suddenly was, joining the old standbys in the shadow of the arching Locust Walk pedestrian overpass - Crockett's wish made whole . . . by his very own wand. Have I noted that its name comes from one of his grandmother's favorite words, Hub Bub? That it has instantly raised the food-truck bar, serving artisan French pastries - including an airy, icing-topped cinnamon roll - from Au Fournil, the estimable Narberth bakery? That its list of brewed coffee and espresso drinks featuring a remarkably bright, earthy, jasmine-scented "Hair Bender Blend" are from beans roasted by Stumptown Coffee, the Portland, Ore., cult roaster that has opened a Brooklyn roastery, sharing the wealth, finally, with East Coast wannabe Stumptown junkies? I've long been a devotee of La Colombe, the hometown Port Richmond roaster. But if La Colombe can hawk its beans out west in San Francisco (which it does), who's to snub Stumptown, two hours north? The company boasts old-school, cast-iron German Probat roasting machines, and varietal beans it purchases, it says, at prices sometimes twice as high, or more, than even average fair-trade payments. There's a lovely little sign on Hub Bub's side noting its Stumptown beans, birds swooping in flight. Its brewed coffee - at $1.50 a cup about 20 cents less than an inferior cup from Starbucks - is from a finca in Guatemala called El Injerto Pacamara. Its aroma is described as having notes of "sweet sage and stewy peaches," though at Hub Bub you also detect, in the ambient air at least, a subtle note of fresh car exhaust from the local tailpipes on 38th Street. What you notice even before the exceptional coffee, though, are the truck's professionally glossy graphics and fire-engine-red paint job. The thing stands out like a cherry-red convertible in a parking lot of drab-pewter fleet cars. Crockett got serious two years ago. He put his name on a list for a city truck-vending license. But he had a Plan B. Realizing that the wheels of licensing can grind exceedingly slow, he applied to business school in Boston, was admitted, got ready to take off in August. That's when the licensing wheels suddenly squealed out. The city papers came through. Crockett deferred business school, quickly got his truck outfitted - espresso machines (his is a gleaming Italian job called La Marzocco) require an extraordinary amount of power, he found out - bought his five-pound bags of Stumptown beans, polished up his barista skills, and took his designated place on 38th. Just in time, of course, for two days of rain. Contact columnist Rick Nichols at 215-854-2715 or rnichols@phillynews.com.